Coaches Lyte Burly and Pete Kautz cover essential drills for 52 such as the rolling punch, shoeshine drills, blocks and counter punches, head movement, sensitivity drills and the science behind why the blocks work to trick the eye! 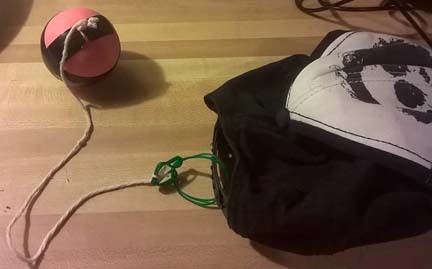 The Fight Ball is an unusual piece of equipment that consists of a ball on an elastic cord that is attached to a hat or headband. It is struck with the fists and rebounds back, like the child's paddle-ball toy but adapted for Boxing. I first saw this device in 2009, being used by Boxers from the former Soviet Union. If you search on YouTube you can find footage of Ukrainian Boxer Vasyl Lomachenko using the Fight Ball, for example. So, it's not an original idea just one that most people in other countries have never been exposed to. So, let's look at training with the fight ball and then see how to build one yourself! The Fight Ball is great at getting you used to things coming at your face. It also builds up a lot of evasion and defensive footwork. If the ball touches you, consider it to be your opponent's glove. Don't let it hit your face or body; parry it off your arms and elbows, slip it, dodge it, and so on. I hope you've enjoyed this article and that it's inspired you to make one of these. I think it will quickly become one of your favorite training devices when you don't have a partner. It's silly looking but gives the feeling of a sparring session better than any commercial device I know of. If you don't have elastic available then use your brain and improvise. One guy saw my videos and put this together using rubber bands, string, a rubber ball and some duct tape! All very clever substitutions for what he didn't have. PS - Like this Article? Sign up for the Training Tips at the top of the page and get an original article like this sent to you by e-mail every week on Tuesday! Check Back Next Week For A NEW Special!